There are three highlights to the good parts. Firstly, it is completely free, secondly, it is very simple to learn and pick up, and thirdly, all the stages are unlocked! Puzzle game lovers are always searching for new games with new challenges that they would find interesting to meet. If that is what is in your mind then ConnectiXX is the app you are looking for. It is more or less similar to the popular game ‘Hashi’, the classic Japanese puzzle game, also known as Bridges. It is available for android users with android 2.2 or up in the device. 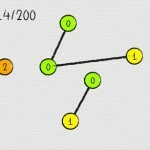 The game play involves joining the given vertices (circles) with a fixed number of edges (lines). It may sound easy, but it surely isn’t when you play. Gift yourself hours of fun by downloading this app. 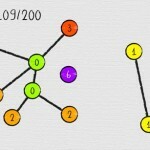 Every circle has a number written in it which represents the number of connections that that particular circle should be having. 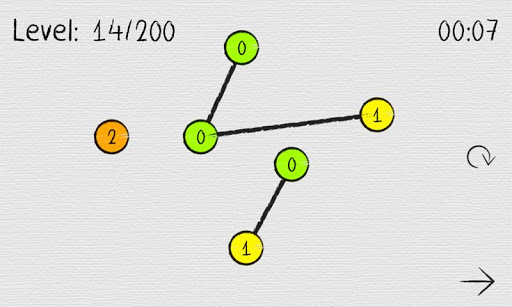 Whenever you connect a circle, the number in it decreases by one. 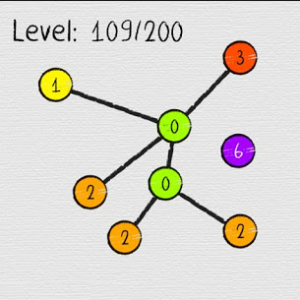 Your aim is to get all the circles down to 0. No existing lines can be crossed. The app has been developed by Matthias Lange and you are going to thank the provider for the same. The game is easy to learn with a very interactive and colourful GUI (Graphic User Interface). It follows the doodle style, keeping it simple. It has 200 levels. The difficulty of the game keeps increasing with every level, slowly. As the tagline goes “Easy to play, hard to master”, this game will get your brain’s clockwork ticking. The game is absolutely free to download. It has an average rating of 4.6 upon 5 by the users. All 200 levels are unlocked i.e. if you want you can try your abilities for any level, you can. The first five levels are easy and they can be tried by teens. A track is kept of how long you take to solve a level. If you are the competitive type, you can run these timings against timings of other players using a ScoreLoop account and see where you stand. A game based menu is provided. This app has a very limited access to your resources. It is made sure that your privacy is not affected in any way. Only your phone’s features are accessed. The internet connection is used only for sockets. 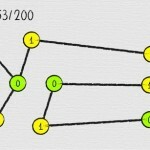 The network state helps determine whether a call is in active state or not. Summary: In all, this mind blogging puzzle is going to get you hooked and will surely make those grey cells of yours exercise their potential. Move on to any level, challenge yourself, bask in the glory of having completed that level and then after that move on the next level. After all, there are 200 of them to complete.